Would you consider yourself a blogging musician? Did you know that there are many ways to make money from your blog? In this episode of The New Music Industry Podcast, I explore five opportunities you can take advantage of as a blogging musician. 00:20 – Is blogging something you should be doing? 00:53 – What kind of content should you share on your blog? Thanks for joining me. 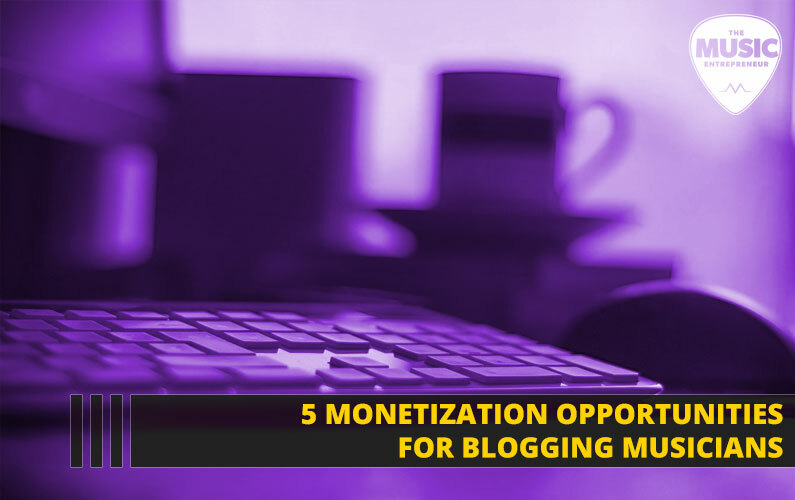 Today, I wanted to look at five monetization opportunities for blogging musicians. Many musicians ask: Is blogging something they should be doing? To me, that mostly comes down to whether you think you can sustain it over the long haul. That means committing to a consistent schedule and publishing on a predictable basis – weekly, monthly. I don’t think you would want to do it much less than that. But you have to get into a bit of a routine and rhythm and that can be somewhat challenging. You won’t get anything from your blogging efforts if you don’t keep it up and put in the effort necessary. But if you choose to blog, you may be able to tap into certain opportunities others simply cannot. That may include opportunities to make more money from your music career. Many musicians ask what sort of content should they be publishing to their blog. I think that’s a separate discussion for another time, and there are many possibilities here but I’ll just throw out a few so you can get an idea of what to post. You can share updates for your fans, tour diaries, reviews of various products or venues, and anything local. It’s much easier for you to connect with people that are in your locality as opposed to those who are further away, which means if you talk about their products, their services, their businesses, or any other effort they might be involved in, it gives them a chance to share their message and spread what they are doing with others. Most people are happy to get that kind of coverage and even share it with their friends and perhaps reciprocate in some way. Let’s get into these opportunities, and just so you know you can take advantage of some of them even if you aren’t a blogging musician. Number one is advertising. I think the easiest route most people can take is to sign up for Google AdWords and begin placing ads on their website. It can be very difficult to make money with ads. It usually takes a lot of time and effort. You also need a significant amount of traffic to your website, or else you won’t see much traction with them. But if you’re blogging regularly, that means you should be attracting regular traffic to your blog, especially over time. Maybe not immediately, but as your archive begins to build up, you will see more people coming to your website, which means, over time, the advertising monetization opportunity grows. Number two is affiliate marketing. If there are specific products that you can recommend to others, then you can earn a commission on them. I talked about affiliate marketing in an earlier episode, so I want to point you to that one as well, but I think the easiest way to get started here is to sign up with Amazon Associates, since they sell just about every product under the sun. Once you’re signed up you’ll be able to search for specific products and the link code that you need to use to promote those products through your website. Just like with advertising, you may not see a ton of traction with affiliate marketing early on. It’s only as your traffic grows and you build trust with your audience that you will begin to see people purchasing and then earn some commissions on those products. It can be a lucrative opportunit,y but getting to that point is difficult so I wouldn’t count on it. Number three is selling digital products such as eBooks. One of my favorite ways to do this is through a website called Gumroad. Setting up an account with Gumroad is essentially free. Selling your PDF documents, or videos, or audio files, through Gumroad is very easy. You may have secret interviews or acoustic covers or videos that haven’t been released. You may have footage that nobody has seen yet, and these are kind of extras that your fans could be interested in. So, if you have a merchandise and physical products already, it’s possible that your fans would also appreciate some kind of digital product that they can purchase from you as well. Speaking of physical products and merchandise, that’s number four. Whether it’s CDs, T-shirts, pins, stickers, sheet music, or books, if you haven’t monetized your website in this way, you are definitely missing out. These days you can set up an online store relatively easily whether it’s with a WordPress plugin (such as WooCommerce) or Shopify or something else. Number five is lessons. You may be able to offer some kind of music lessons through your site such as guitar, bass, drums, or vocals if you are particularly skilled in any of these areas. You can potentially do all the work from home because you could offer Skype lessons. For this podcast episode, I picked five examples of different things you can do to monetize your blog, but there are so many other ways to go about it. I just thought these were the most accessible and probably some of the easiest to wrap your head around.